Motorola just step up by challenging Apple Inc.'s iPad atleast for the 1st generation of Apple's wildly popular device, which launched a year ago. while the iPad branders Apple is expected to unveil the second-generation iPad next week here is Motorola Xoom Tablet prior to it. It is supposed that Motorola's Xoom may affect the Sales of Apple's winning tablet business. The iPad's 9.7 - inch screen is a bit brighter than the Xoom's. The Xoom is the first tablet running a new version of Google Inc.'s Android software designed specifically for tablets, rather than earlier versions that were meant to work on much smaller smart phones. When IHS iSuppli opened up the Xoom, it spotted two components that should make for a speedy device. One is a dual-core processor from Nvidia, which controls how fast the gadget runs its software. In theory at least, this should be about twice as speedy as Apple's own chip. The Xoom also packs more of the type of memory that helps applications run faster. 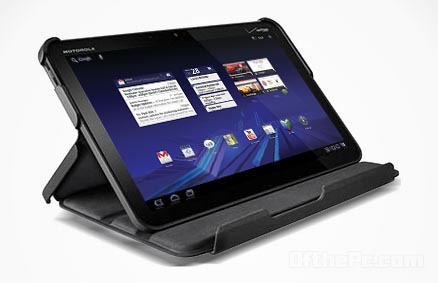 "On paper, Motorola's Xoom should be running laps around the iPad," . In practice, however, he said it also depends on how well Google's software takes advantage of the powerful hardware. Motorola appears to have skimped a bit on the quality of the display, at least compared with what Apple was willing to spend. Lam said the Xoom has a more limited range of colours. The iPad will also do a better job of showing people what's on the screen even if they're not looking at the device head-on, whereas on the Xoom, the image will appear to fade out when the tablet is held at an angle. The parts of the Xoom that control how touch-sensitive the screen is, however, are on par with what's inside the iPad, Lam said. The iPad which runs for about 10 hours, may still have an edge, though this, too, depends on software and other factors. The iPad has two batteries that are each twice as big as the single battery in the Xoom, Lam said. In addition to GPS, an accelerometer, a gyroscope and other sensors also found in Apple's newer gadgets.